In Part 1 of this series, I walked through the process and experience of signing up for the Azure SQL Managed Instance preview and the deployment process once approved. I also covered some of the issues I ran into. In this installment, I will take a look at deploying Microsoft Dynamics GP and, again, looking at the process and experiences I encountered while doing so. One of the steps within the deployment of a Managed Instance is the provisioning of a VM to be able to connect to the service. The instructions call for downloading and installing Microsoft SQL Server Management Studio on the VM. I figured, this is the VM I would also be using to install Dynamics GP, IIS, and Web Client. NOTE: Currently, you cannot connect to a Managed Instance from outside of the Azure vNet infrastructure, and frankly it makes a lot of sense. a) A Managed Instance is configured to support Mixed Mode Authentication. This is good news for Microsoft Dynamics GP as it is been a long established requirement. b) The SQL Server system administrator (sa) user is disabled, but exists, unlike Azure SQL. When creating the Managed Instance, you are required to set up a separate SQL administrative account (more on this later). c) You cannot use SQL Server Configuration Manager to make any changes to the deployed configuration, hence the "Managed" in Managed Instance. I also downloaded Dynamics GP 2018 from PartnerSource, along with the January Hotfix. In addition, I added .NET Framework 3.5 (using Server Administrator) as it is a prerequisite needed by the Dynamics GP Bootstrap setup program. I ran through the tricks book on this one to no avail and could not get past this problem. 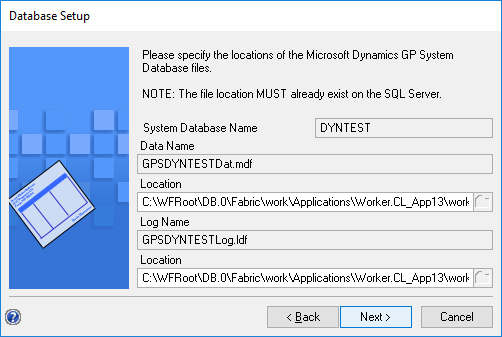 Next, I proceeded to enable the SQL Server sa account and was able to log into Dynamics GP Utilities without any issues. NOTE: The admin account I created during the Managed Instance deployment worked just fine when the Dynamics GP installer asked for the server and account credentials to create the ODBC driver. Note the location of both the data and log files. Specifying files and filegroups in CREATE statement is not supported on SQL Database Managed Instance. Once again, not all was lost because, while I could not get Dynamics GP Utilities to create the system and company databases due to how the CREATE DATABASE is constructed, I was certain of another method that would work. Find out in my last installment of this series what I did to get things going -- yes, this story has a happy ending .